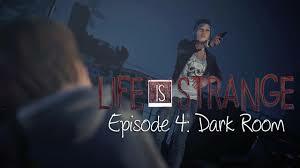 The penultimate episode begins after the cliffhanger from the last episode, finding Max and Chloe in an alternate timeline created by Max's changes in the past. We finally get to see the full extent of Max's powers, and what can happen to her world when she uses them. The story here is strong, and the choices have never been harder or more heartbreaking. Even though this is an alternate timeline, the actors really do an excellent job of making these characters really relatable, and you want them to have the best possible outcome. However, in this case, the best possible outcome really is up to the perceptions of the player. That makes these choices seem more real than those before them, even though the time spent with these versions of the characters is short. The alternate universe also lent a lot to making Arcadia Bay feel fresher than it had since we first visited it. We're still exploring the same houses and locations, but the changes have made these areas a lot more fun to explore. There are also some weird disasters that don't quite seem natural, which seem to tie into the visions that Max has been having since episode one. The episode also ends on another cliffhanger, as the main villain of the season is finally revealed. This entire season has been exciting, but this episode really was a wild ride. With the reveal at the end and the shock that came with it, the final episode definitely has to live up to a lot.